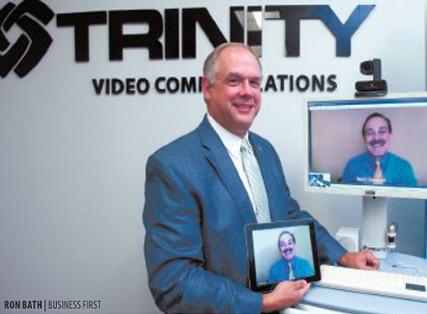 Trinity Video Communications, Inc. officials see a strong future for the company in health care. Since its founding in June 2000, the Louisville-based audio and video communications technology firm has provided videoconferencing services to corporate clients and served the education, manufacturing and government sectors. Now, Trinity Video Communications is looking to make an impact in the field of telemedicine, particularly with long-term care facilities. Trinity Video makes a telemedicine cart, which has a monitor and camera system that allows doctors to interact with patients remotely, CEO Barry Sawayer said. The use of telemedicine is not new to health care delivery here. Telemedicine has been embraced by acute-care providers such as KentuckyOne Health Inc. and Norton Healthcare Inc. as a way of connecting physicians with patients in rural areas of the state. But the long-term care industry has been slow to embrace telemedicine because it could not justify the costs, said John Jennings, Assistant Vice President of Midwest Operation and Chief Technology Officer at Trinity Video. “They’ve hardly even looked at it,” Jennings said. Sawayer said a conventional telemedicine cart or robot could cost more than $40,000. Trinity’s cart costs about $10,000. The lower price could enable long-term care companies to make use of the technology. Trinity Video’s cart uses a touchscreen monitor, alleviating the need for a keyboard. And Sawayer said doctors can use smartphones to connect with patients via the cart, which is monitored by a facility staff member. Diagnostic tools such as blood pressure cuffs and electrocardiogram sensors are connected to the cart through USB ports, allowing physicians to obtain readings of vital signs, Jennings said. Sawayer said the cart should improve efficiency of physicians attending patients in long-term facilities as well as increase patients’ access to their doctors. Trinity Video, which has 55 employees, can customize the product for users in a number of ways. For instance, the company is working with a home health industry client, which officials declined to identify, to develop a new version of the cart that can fit into a briefcase for increased portability. And Sawayer said his company has a partnership with Louisville-based SignatureHealthcare LLC related to the carts. He said Signature purchased six carts to test and provide feedback to Trinity. Sawayer hopes the partnership will lead to wider use by Signature. And he believes what is learned from the testing could help others in the health care industry see the advantages of the telemedicine cart. Visit www.trinityvideo.net for more details on Trinity’s Mobile Telemedicine Station. Or, contact us today at 1-800-261-9008 to speak with a Trinity representative to schedule a demonstration at your location or at our Louisville, Kentucky or Sterling, Virginia offices.